No more frantic scribbling on a yellow tablet to track and manage your crime scene. 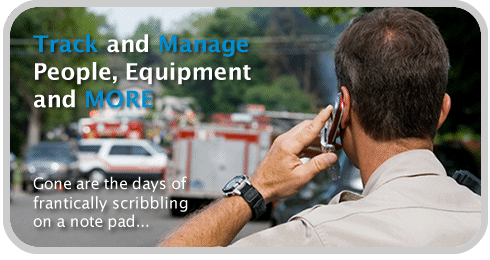 Now you can electronically manage people, track assets, and log evidence for on-scene emergency management. A powerful solution to quickly and easily manage people and assets for on-scene emergency management. 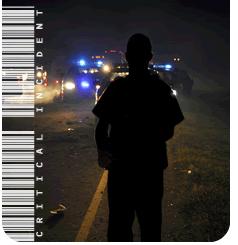 Manage People: All personnel working the scene are entered into the system and given a barcoded ID badge that shows their identity, their assignment, who they report to, and so on. The person's ID badge is scanned before they are allowed into the scene. The system maintains an unalterable record of the comings and goings of that person from the scene. Manage Assets and Evidence: Allows you to barcode, document, and manage all evidence and assets collected while on location, giving you an unalterable chain of custody. Browser-Based: Wirelessly sync all captured data over a 3G network to your remote database.The appropriate and authorized personnel have access to the data instantly when and where they need it. Upon arrival at the command post, the individual checks in and presents his or her credentials, ID, or badge. This information is entered into the system along with that person's specific duties at the scene. A barcode label that displays the person's name, duties, and supervisor is then generated and attached to his or her ID. The database is housed locally on a laptop or on a remote server, accessible through an Internet web browser using WebView. In the event of a major emergency management situation, the database is accessible (regardless of how far away it is from the actual scene) to manage the people and equipment at the incident scene. The Profile (home) screen is completely customized to the specifications of the individual law enforcement agency. Every field on this screen is user-configured and searchable, and has the flexibility to be modified at any time to meet your changing needs.